High Street bank Santander is phasing out cheque guarantee cards for its customers, although they can still write cheques. New debit cards being issued to customers of the former Abbey and Alliance and Leicester will not include the guarantee function. The guarantee card system, which began in 1969, will end on 30 June 2011. The future of cheques is also being debated, with plans for the payment system to end in 2018. The guarantee is noted on a card using a hologram picture of Shakespeare, but only a small proportion of cheques are guaranteed under the system. All banks have agreed to run down the system by June 2011, but after that date, businesses will still be able to accept cheques. 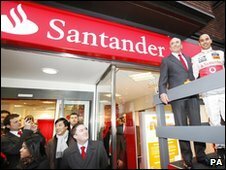 Santander said that it was starting its withdrawal now to manage the change. "In light of the need to replace around five million debit cards which have a cheque guarantee logo, Santander is taking a phased approach to make this task more manageable," said a Santander spokesman. "This approach should ensure that these debit cards are replaced in a measured and efficient way, so customers are not faced with a delay in replacing their card, which would be likely if this phasing did not take place. "We are giving customers plenty of notice of this change. Customers will still be able to use cheques. It is just the cheque guarantee element which is changing." The original guarantee limit 40 years ago was £30. Nowadays, 88% of all cheques in the UK have a £50 or £100 guarantee limit. In July, HSBC said that its 300,000 customers who had a £250 guarantee limit on their cards would have this limit reduced to the standard £100 for most other customers.